Boys will be boys, and Gilbert the Great was no exception. In fact, he very often over stepped the mark. You see, Gilbert was a ladies’ man and all the ladies loved Gilbert. Well almost all! The posh girls loved Gilbert despite his amorous ways. The raunchy rooster would strut about the yard with his chest out, trying hard to make himself look twice the size and butch. Although he was a great protector, Gilbert the Great was actually surplus to requirements. You see, hens do not need a rooster in order to lay eggs but they need one, if a chick was to be born. 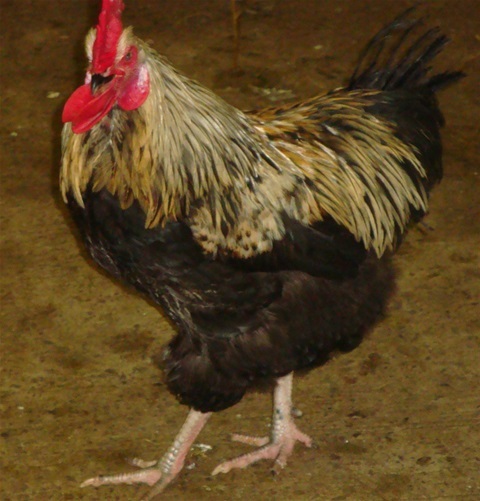 Gilbert the Great would sit on a fence at our home for waifs and strays, and threaten anyone that came near his girls...especially those that were sitting on eggs. I’m sure the poor postman dreaded coming anywhere near the place and often left parcels in a house across the road. As you can imagine, Gilbert the Great didn’t make us very popular! When Sandwich first saw Gilbert, she was pitiful looking, having just arrived from the battery farm, and so Gilbert didn’t pay her much attention, however, he did tend to watch her over the shoulders of the posh girls. And when Sandwich’s feathers returned to full shiny glory, she outshone all the others. In fact, she looked amazing. Gilbert the Great saw the transformation and would strut across the yard towards her. He would dance the cockerel waltz, with one wing stretched downwards. This amused our many visitors but certainly not Sandwich, at least, not at first. In fact, they almost came to blows, on many occasions. This, it seemed, only fuelled Gilbert the Greats amorous ways. As I watched the love affair develop between Sandwich and Gilbert, I often wondered if she knew that this raunchy rooster had the potential to fulfil her dreams. Remember the egg she craved for, at the battery farm, the one that almost rolled away? I knew then, that Sandwich would make a great mother one day. But whether Gilbert the Great would win her over, you will have to wait and see.....It’s later than you think now, and the house is quiet once again. I can hardly keep my eyes open....Oh no! It’s that strange noise again, coming from Mocha’s old room. Time for Bed!